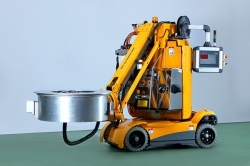 One solution to increase safety in the cleaning of tire moulds is to use robots. LKY has therefore developed a dry ice cleaning system where fully automated sidewall robot technology independently blasts the tire moulds with dry ice. Noise levels remain under 84dB(A), conforming with all European safety requirements. Staff can therefore control the machine from a distance and avoid contact with the heavy machinery, ensuring safety and ergonomic operation. Apart from dry ice cleaning systems, LKY also offers in-plant material transportation, tire curing and building bladders, tire mould management, pigment pre-weighing and ultrasonic cleaning technology for moulds and vents.